MINI is introducing the sixth car in its model line-up, this time the Roadster. The Roadster follows on from the recently introduced Coupe and this is the first open-topped two-seater in the company's history. It features a semi-automatic soft-top roof that cannot be operated while the MINI Roadster is on the move and although it’s not what you would call roomy it has a 240-litre luggage area and through-loading system. Selling alongside the Hatch, Convertible, Clubman, Countryman and Coupé, the Roadster will arrive in UK showrooms next spring. As with the recently launched Coupé, all variants of the Roadster carry the Cooper name in their model titles. Full details of standard and optional equipment on each will be released nearer the launch. A wide range of accessories and personalisation choices will be available, says MINI. Power comes from BMW’s four-cylinder petrol and diesel engines. Outputs range from 120bhp in the Cooper Roadster to 211bhp in the John Cooper Works version. MINI's performance diesel engine, the 141bhp Cooper SD launched earlier this year is also available as is the 182bhp Cooper S unit. Fuel economy stretches from 38.7mpg to 62.8mpg, while CO2 emissions are 118g/km on the Cooper SD. The John Cooper Works Roadster emits 169g/km. Like the Coupé, the Roadster is fitted with an active rear spoiler that's integrated into the tailgate. It extends automatically as soon as the car reaches 50 mph and drops back at 37mph, though can also be operated manually. All versions of the Roadster come with fuel efficiency tech such as brake energy regeneration, start/stop, optimum gearchange display and thermal encapsulation of the drivetrain, which shortens the fuel-sapping warm-up period after a cold start. Standard equipment includes speed-sensitive steering assistance, electrically adjustable and heated exterior mirrors, rear parking help, air conditioning and an audio system with MP3-compatible CD player, DAB radio and aux-in connection. Safety features include front and head-thorax airbags and stainless steel roll-over bars. The Roadster is available in two non-metallic and six metallic paint shades. The roof remains in black while sport stripes are available in three colours for the bonnet, boot lid and rear apron. Alloy wheels of 15, 16 or 17-inch diameter are standard, depending on the model. Prices start at £18,015 for the Cooper Roadster and extend to £24,850 for the John Cooper Works Roadster. 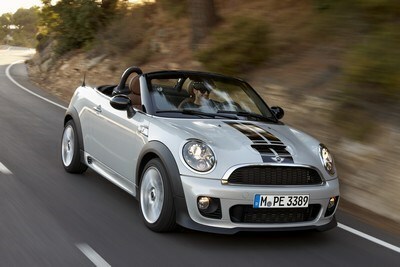 Did you know the most popular review for the Convertible range is the MINI Convertible review.